Guanacaste is a province of Costa Rica. It is in the northwestern part of the country, bordering Nicaragua. The provincial capital is the city of Liberia. 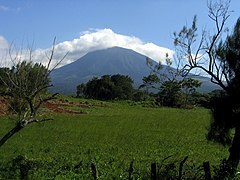 The Guanacaste province borders the provinces of Alajuela to the east,and Puntarenas to the southeast and southwest. The Pacific Ocean is to the south and to the west, and Nicaragua is to the north of the province. Guanacaste is the second largest province of Costa Rica, after the Puntarenas province, with an area of 10,140.71 km2 (3,915.35 sq mi). Orosí, an inactive volcano, 1,440 m (4,720 ft) high. The people of the province are known as Guanacastecos (women: Guanacastecas. The Guanacaste province had a population, in 2011, of 326,953 for a population density of 32.2 inhabitants/km2, the province with the lower density. The canton of Liberia, with 62,987 inhabitants, is the canton with more inhabitants. The Guanacaste province is divided in 11 cantons, which are divided into 59 Districts. The main economic activity in the province is farming, mainly cattle raising. Important crops in the province are cotton, sugarcane and rice. Alajuela has attracted many export-orientated manufacturing companies, especially within the free trade zones around the municipality of Alajuela. Tourism is an important activity because the combination of beaches as Playas del Coco and Playa Tamarindo, and the sunny dry season that coincides with the winter months in northern latitudes. Many tourists also visit the national parks in the province. ↑ 1.0 1.1 1.2 "Anuario Estadístico 2012 - 2013" (PDF) (in Spanish). San José, Costa Rica: Instituto Nacional de Estadística y Censos (INEC). June 2015. Retrieved 12 December 2016. ↑ 2.0 2.1 2.2 "Anuario Estadístico 2012 - 2013" (PDF) (in Spanish). San José, Costa Rica: Instituto Nacional de Estadística y Censos (INEC). June 2015. p. 103. Retrieved 11 December 2016. ↑ "Provincia: Guanacaste" (in Spanish). Guías Costa Rica. Retrieved 12 December 2016. ↑ "Anuario Estadístico 2012 - 2013" (PDF) (in Spanish). San José, Costa Rica: Instituto Nacional de Estadística y Censos (INEC). June 2015. p. 51. Retrieved 12 December 2016. This page was last changed on 14 November 2017, at 23:00.